See pic of lamp packages for more info. Great lamps. Wish this was still made. Didn't they use zinc shot to frost these? Power Groove, they were a 2 step acid etching process invented by Marvin Pipkin in 1927. I have a 60 watt A-21 MAZDA with a C-9 filament from 1927 with an outside etch and dated 1927 on the etch that is a prototype he made. YES it is ultra rare, possibly the ONLY one in existence. The etch is worn but legible. In 1944-45 he developed the Q-Coat process for the emerging GE "White" lamps later known as soft white, and used step one of the acid etching process to make a light inside frosted bulb that was semi transparent but still frosted, and then applied a smoke-thin sprayed on coating of fused silica over it to make some of the most beautiful soft white bulbs in history! This was when GE had REAL engineers that cared and weren't designing LED bulbs on a computer, and not making any prototypes, ans putting the resulting (junk) product on the market with ZERO testing or R & D like they do today, or just re-branding one already in production in China and selling for a high price as a "GE". Those old GE's were good stuff back them and I was a little kid born in 1966, December 20th) but LIVED that era. And a bulb rated at 1000 hours lasted a couple years, today they can't manage ONE YEAR at that rating. I still find these oldies in basements, closets, attics, even bedroom lamps, still in use and still going strong! 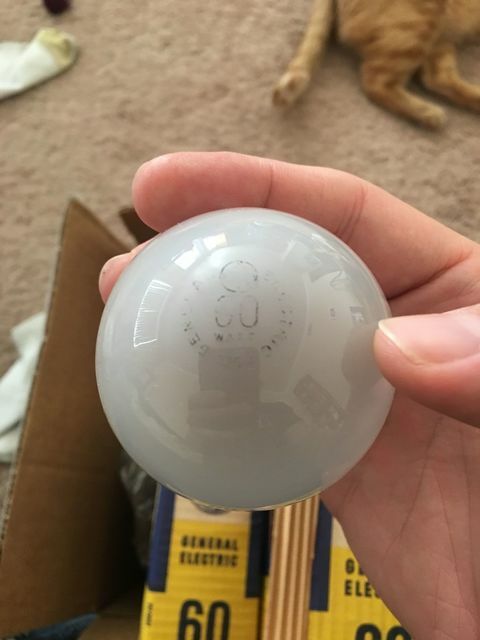 I usually grab them if I can get a replacement (NO LED TRASH!!!!!!!!!!!!!!!!) for them. But no they were not blasting etched but a 2 step (with 2 different strengths of acid) process, the initial etching makes the frosting, and the second rounds the points of the etches, makes the frosting more translucent and increases the strength of the glass. Some Q-Coat have a special light frosting, some have regular inside frost in the 2 steps with the smoke thin silica powder over that. Merry Christmas. Thanks for the info ricksbulbs. Who's that furry person creeping into the shot there..? Mine is a pig in a fur coat. Very nice find! So much better made than the junky halogens nowadays.